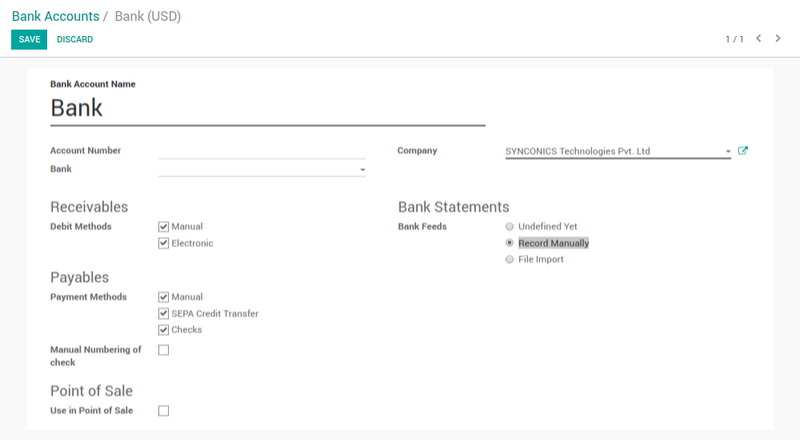 RECEIVABLE-PAYABLE | Synconics Technologies Pvt. Ltd.
forecast ofyour future bills to pay. Advanced Payment terms: Support for multiple payments for one invoice, cash discounts, advance invoice, partial reconciliations. 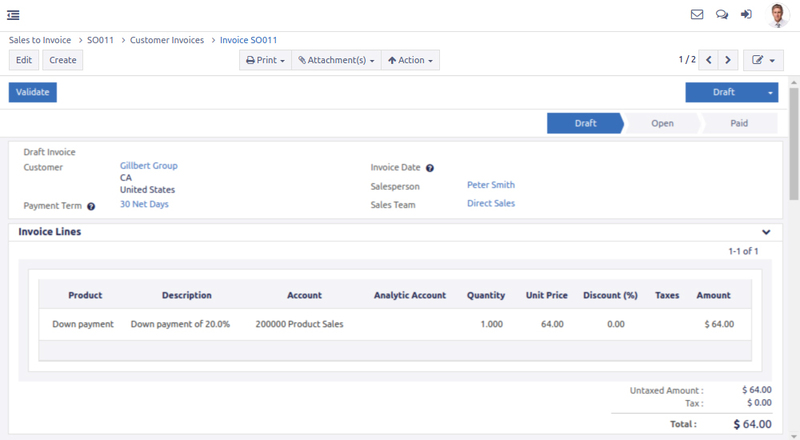 Draft invoice propositions: Draft invoices are created automatically by ERP based on sales order, timesheets or delivery orders. 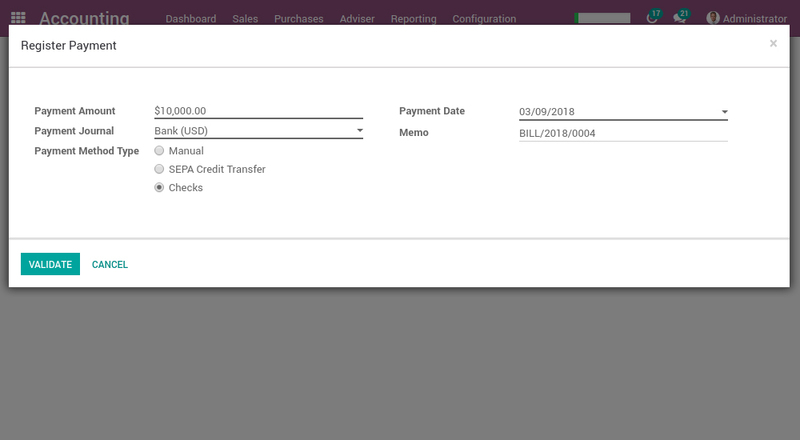 On-the-fly payment reconciliation: When creating an invoice, ERP suggests outstanding payments automatically so that you don't have to reconcile it later. Credit Card Payments: Get paid quickly by supporting online payment with credit cards. We support main payment gateways like Authorize.net, Ingenico, Paypal, Adyen etc. Automated follow-ups: ERP proposes emails, follow-ups letters and tasks automatically to ease your credit collection process. Aged receivable balance: The aged receivable report gives you a clear overview of overdue payments and treasury forecast. Customer portal: Your customer can track their order status, invoices and payments through their portal. 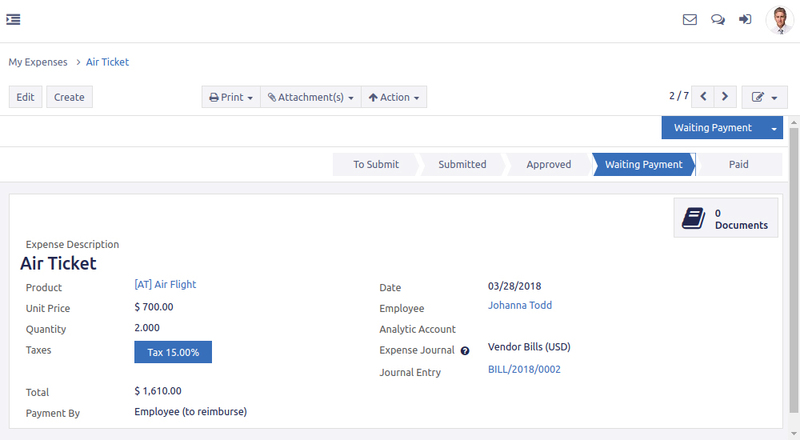 Advanced customer statements: Get clear reports on customer statements and navigate easily through the documents to understand every customer use case. Employee expenses: Track employee expenses, from the recording by every employee to the validation and reimbursement. Forecast expenses: Get a clear forecast of your future bills to pay. Control supplier bills: Simply register on the forum to post questions and answer existing ones. 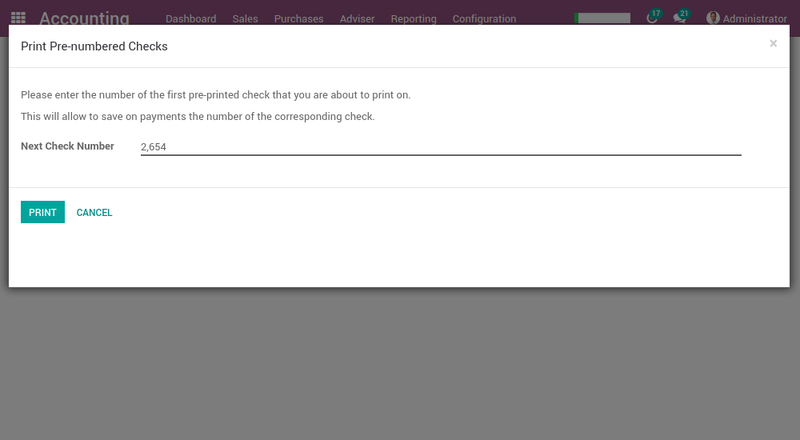 Print checks: Get a proposition of supplier bills to pay and print checks in batch in just a few clicks. Deposit ticket: Keep track of deposit tickets in just a few clicks to ease the bank reconciliation process. 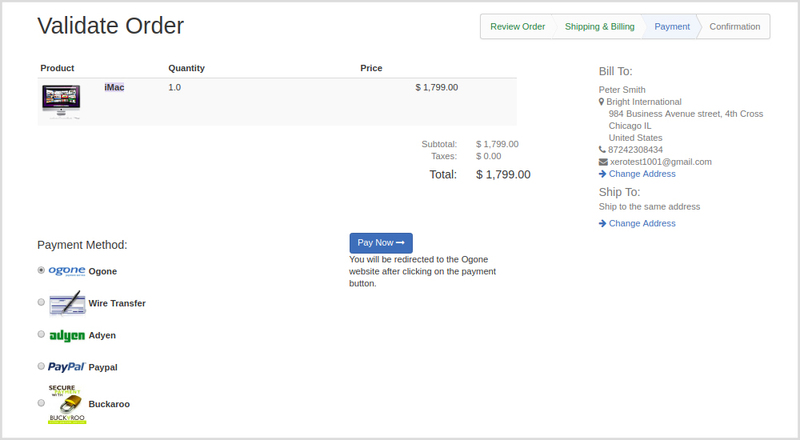 Organize payment orders: Support your own payment flows with optional validation steps. Automate bank feeds: Get your bank feeds automatically from the bank. 15,000 banks supported, mostly U.S., Canada and NZ ones. Manage cash registers: Track every cash transaction with opening and closing easily. Import Statements: If your bank is not supported, use OFX, QIF, CSV or Coda files to import statements easily. Smart Reconciliation Tool: Get reconciliation propositions automatically, register extra journal items on the fly, search efficiently. 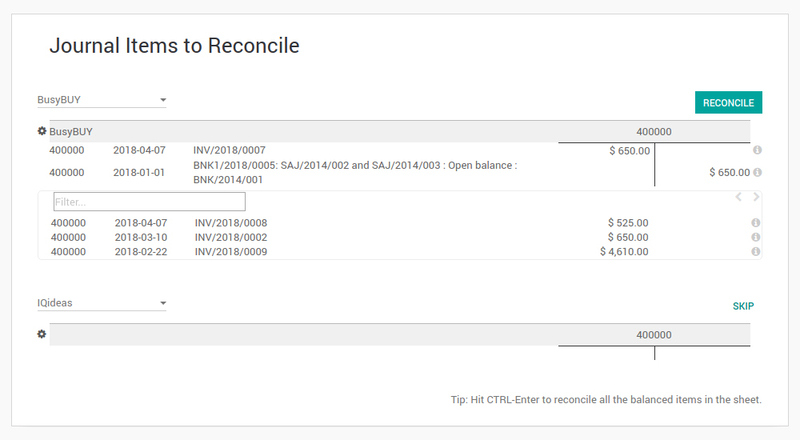 Interface for manual reconciliations, for both open and paid invoices. Learning of account numbers based on first manual reconciliation. Reconciliation Report: Audit differences between your accounts and your bank statement balance to ease reconciliation. Bank Reconciliation: ERP matches 95% of invoices & payments automatically and the smart matching tool allows to do the remaining 5% super fast. Easy outstanding payments: Get partial and full reconciliation proposition directly from the invoice or the bank statement. Reconciliation: Smart Reconciliation Tool, Reconciliation Report, Bank Reconciliation, Easy Outstanding payments. Hierarchies of cost accounts: Structure automatically your analytic accounts based on projects, contracts, departments etc. 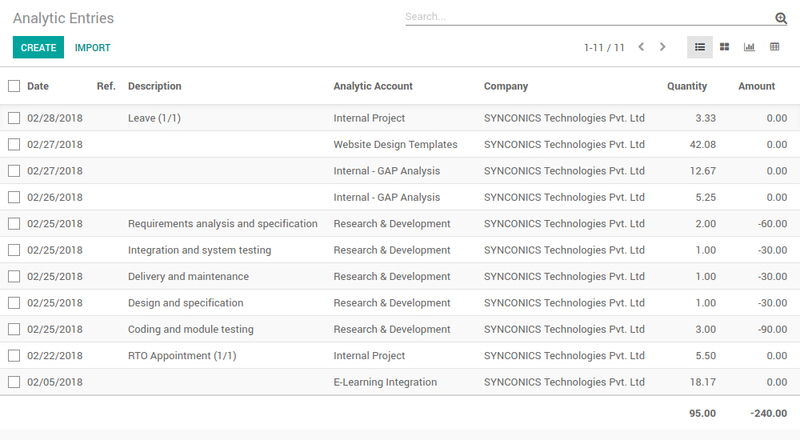 Fully integrated: Get analytic entries automatically produced based on timesheets, supplier bills, work orders etc. Multiple-plans: Manage multiple analytic plans with default values and assignations ratios between cost accounts or projects. 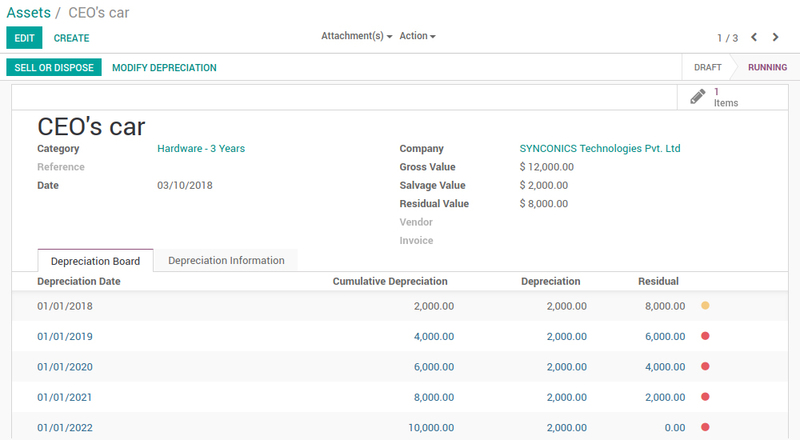 Assets Management: Track assets, depreciation boards and generate amortization entries automatically. Manage all events on your assets in just a few clicks. Revenue Recognition: Manage multi-year contracts, automate deferred revenues entries and get clear dashboards on your recurring revenues. Budgets: Track your budget and compare actual performance with different budget. Manage budget on your financial accounting or analytic accounts. Revenue dashboard: Get all your SaaS metrics in a clear dashboard: MRR, Churn, CAC, CAC ratio, Growth forecasts, ARR, CLT, CLTV.